Dog cherry eye is a common eye issue in canines. It causes a red blob on the lower eyelid due to inflammation of tear producing gland. Cherry eye is most common in certain dog breeds including Cocker Spaniels, Bulldogs, Pekingese, Lhasa Apsos, Beagles and Boston Terriers. In this guide, I will be talking about cherry eye treatment options, surgery, reasons why cherry eye comes and goes and also home remedies that pet parents can use to keep their baby comfortable. What is dog cherry eye? “I see a red thing on my dog’s eyelid”. The ‘red thing’ is the inflammation of the tear producing gland usually located on the lower eyelid. If you are wondering whether cherry eye is painful, the answer, thankfully, is it is not. It definitely looks scary and serious but your dog will not be in pain or too much discomfort. Many pet parents report that cherry red swelling comes and goes away every now and then. This is also normal. The swelling subsides and goes away in a couple of days but it recurs within a short period of time. Unlike humans, dogs have three eyelids and the reason why cherry eye occurs is because the tear gland is not well anchored to the lower eyelid. In some serious cases, the tear gland remains out permanently in which case, surgery is the only viable option to treat the condition. The fibrous attachment to the undersurface of the third eyelid becomes weak. This results in prolapsed or bulge of the tear producing gland resulting in cherry-like growth that is really the normal-size tear gland. Most common symptom is red cherry-like growth or bulge on the lower eyelid in the corner of the eye. It usually occurs for the first time in dogs below 2 years of age. 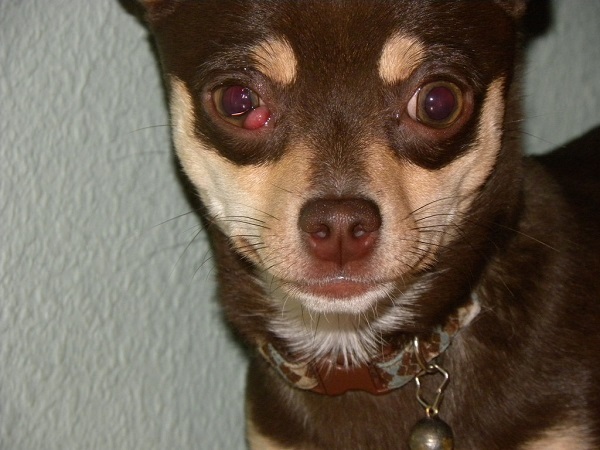 Dogs prone to cherry eye also suffer from conjunctivitis frequently. This is characterized by watery or pus-like discharge. Dogs with cherry eye are also more likely to develop dry eye. Dry eye is also known as keratoconjunctivitis sicca. Many doctors prescribe antibiotics for cherry eye which make the swelling go down temporarily. However, despite antibiotics, the nictitating membrane gland often remains dislodged. So antibiotics may not be a permanent solution. Ophthalmic antibiotics help ease chronic inflammation. Sulfonamide antibiotics can ease dry eye. Cyclosporine and combination of artificial tears can help in some cases. In some dogs, a combination of corticosteroids and antibiotics can also ease the symptoms temporarily. Is cherry eye painful? Why does it come and go? As stated above, cherry eye will not hurt your dog but s/he may show signs of discomfort like excess blinking, or keeping the eye closed or even discomfort caused due to pus-like or watery discharge. The reason why the condition comes and goes is due to permanent prolapsed of the tear gland which can only be corrected surgically. 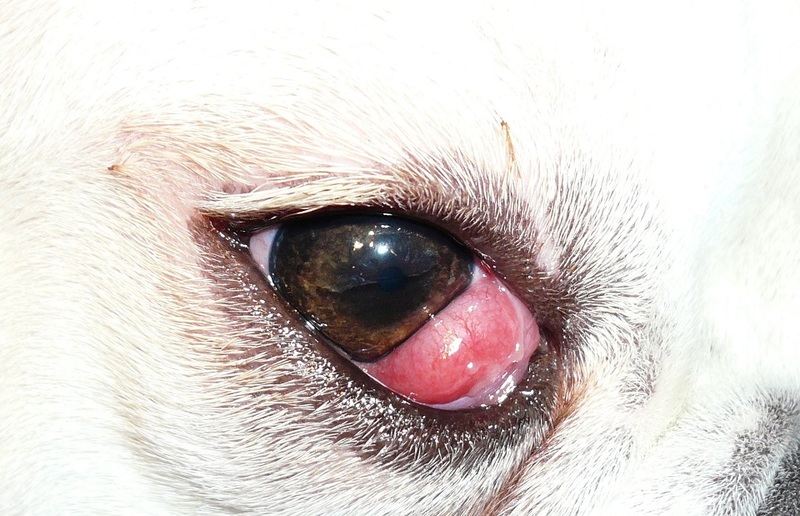 Cherry eye can sometimes obstruct your dog’s vision. In most cases, antibiotics and corticosteroids can help. Sometimes, the swelling goes down on its own. However, you need to keep an eye out to see if the condition recurs. In case it does, and typically, it will, your dog will need corrective surgery. This is especially the case when the tear gland remains out permanently. This type of eye surgery requires tacking the gland into position. Many veterinarians perform the procedure but it is best to seek out the services of an experienced veterinarian ophthalmologist. 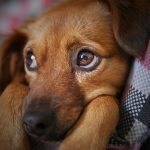 You may even want to develop a rapport with this expert since dogs with propensity to cherry eye are also more likely to develop other eye issues in the future. Note that the surgery is not a guarantee that the cherry eye won’t recur. In the past, cherry eye surgery consisted or removal of the entire tear gland. This needed a lifetime use of eye drops since the pet could not produce tears. Today, vets know the importance of the tear gland and prefer repositioning or tacking the gland back into position. This is the main reason why there is no guarantee that the condition will not recur despite surgery. Having said that, there is a 80% success rate in most cases. Dog cherry eye surgery can cost anywhere between $300 and $1000 depending on the area you live in and the experience of the vet performing the procedure. 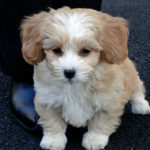 Discuss all your options thoroughly with the expert and decide what is best for your pet. 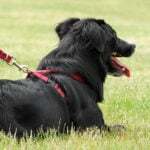 Some pet insurance companies cover the cost of this procedure. Recovery from the surgery should not take more than 3-4 days. Your vet might instruct using a collar to prevent your pet from scratching its eye. You also need to apply the ointment or eye drops as needed to heal the inflamed tissues. As can be seen there is not much you can do in case your pet develops cherry eye other than take him/her to the vet. You can manage symptoms of the condition by using prescribed ointments and cherry eye treatment antibiotics. Use a warm compress or saline rinse to handle the discharge. Avoid taking your pet to dusty areas where the condition can worsen. Use a pet collar to prevent your dog from scratching the eyes. Many pet parents are intimidated at the thought of putting eye drops or administering eye ointment in their pet’s eyes. However, with a little practice, you can become a pro at this. An assistant will need to hold the dog if s/he squirms too much. If you have a high grooming table, place your pet on it. This is naturally only applicable to medium or small dog breeds. Apply the eye wash or saline rinse on a cotton wool. Firmly but gently clean the pet’s eyes to remove discharge, if any. Use separate cotton balls for each eye. This is necessary to prevent the spread of germs from one eye to another. Next comes the medicine. An important thing to remember is to never touch the bottle/dropper or tip of the ointment tube to anything including your pet’s eyes, your fingers etc. This is necessary to prevent contamination. Try a practice squeeze of the tube or bottle before you begin. Hold the bottle of drops in your hand. Keep your dog in front of you but facing away from you. Use your other hand to tip his face (nose) upwards so that his eye is at a horizontal level. Hold the bottle 2 inches above your pet’s eyes. Firmly squeeze the bottle. Your pet might try squeezing its eyes shut, in which case, you need to gently but firmly open its eyelid with the thumb of your other hand. In case you are using an ointment, tip your dog’s face upwards, lift the upper eyelid and apply the ointment on the white areas of your dog’s eyes. 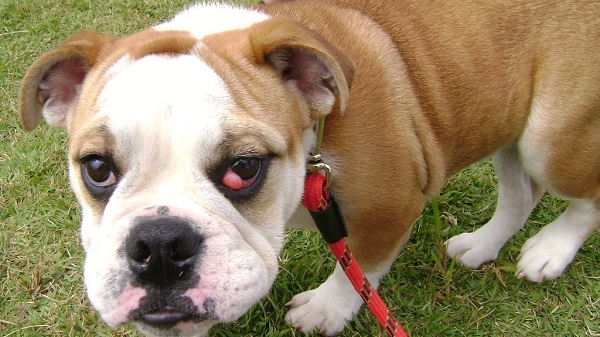 Cherry eye is an uncomfortable condition that impacts certain dog breeds. In most cases, surgery is the only treatment option and it involves repositioning the third eyelid and tear gland. We hope this brief guide helps you. What Dog Harness and Liner is Best for Your Dog and Yourself?